“Woven Jewels from the Black Tents: Baluchi, Aimaq, and Related Tribal Weavings of Iran, Afghanistan, and Pakistan”, is a current exhibition at the GMA which includes some examples of war rugs. The guest curator is emeritus Professor Stephen Jett, University of California, Davis. I’m not sure of the source of this photograph, its date, or location (all of which would be interesting) but the rug depicted here is clearly an earlier version of the rug contributed by Max Allen in our previous post. A deeper source of the (photographic) imagery for these rugs is found in Dr Whitney Azoy’s article “Masood’s Parade: Iconography, Revitalisation and Ethnicity in Afghanistan” in Expedition magazine (the link is to a PDF file). 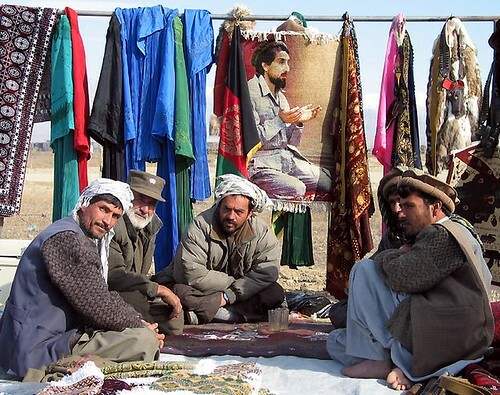 The article discusses the pervasiveness and range of iconographic mood in the photographs, posters and paintings of Masood available in Afghanistan in 2002.